Demolished 1966 - if you have any photos of the tower please let me know! Class A bomber airfield, built 1942-3 by the US Army 818th Engineer Battalion (Aviation), opened 01/07/1943. 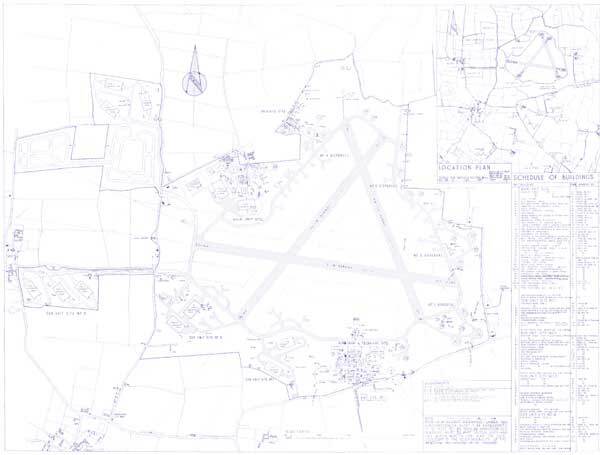 24/09/1943 to 02/10/1944, 552nd, 553rd, 554th and 555th Bombardment Squadrons of the 386th Bombardment Group moved here from Boxted with B-26 Marauders. 16/10/1943 Transferred from the 8th USAAF to the 9th USAAF. The 386th Bomb Group flew 28 missions from Boxted and another 257 from Great Dunmow before moving to France, 02/10/1944. 10/1944 to 12/1945, No. 190 and 260 Squadrons with Stirling bombers, converted to Halifax post-war. 12/1945, 190 Squadronn disbanded and 260 moved to Palestine. Airfield then used for storage of army vehicles until 1948.